Brachyspatha konjac (K.Koch) K.Koch, Wochenschr. Gärtnerei Pflanzenk. 4: 13 (1858). Amorphophallus rivierei var. konjac (K.Koch) Engl. in A.L.P.de Candolle & A.C.P.de Candolle, Monogr. Phan. 2: 313 (1879), nom. illeg. Conophallus konjak Schott, Syn. Aroid. : 34 (1856). Amorphophallus palmiformis Durieu ex Rivière, Actes Soc. Linn. Bordeaux 28: 15 (1869), not validly publ. Amorphophallus rivierei Durand ex Carrière, Rev. Hort. (Paris) 42: 573 (1871). Proteinophallus rivierei (Durand ex Carrière) Hook.f., Bot. Mag. 101: t. 6195 (1875). Tapeinophallus rivierei (Durand ex Carrière) Baill., Dict. Bot. 1(5): t. s.n. (1877). Hydrosme rivierei (Durand ex Carrière) Engl., Bot. Jahrb. Syst. 1: 188 (1880). Conophallus konniaku Schott ex Fesca, Beitr. Jap. Landwirthsch. 2(Spec. Theil): 241 (1893), orth. var. Amorphophallus mairei H.Lév., Repert. Spec. Nov. Regni Veg. 13: 259 (1914). Amorphophallus nanus H.Li & C.L.Long, Aroideana 11: 8 (1988 publ. 1989). Koch, K.H.E., 1858. Wochenschr. Gärtnerei Pflanzenk. 1:262. Govaerts, R. et al. 2018. Amorphophallus konjac in World Checklist of Selected Plant Families. The Board of Trustees of the Royal Botanic Gardens, Kew. Published on the internet. Accessed: 2018 Nov. 09.
International Plant Names Index. 2018. Amorphophallus konjac. Published online. Accessed Nov. 09 2018. The Plant List 2013. Amorphophallus konjac in The Plant List Version 1.1. Published on the internet. Accessed: 2018 Nov. 09. Tropicos.org 2018. Amorphophallus konjac . Missouri Botanical Garden. Published on the internet. Accessed: 2018 Nov. 09. USDA, ARS, Germplasm Resources Information Network. Amorphophallus konjac in the Germplasm Resources Information Network (GRIN), U.S. Department of Agriculture Agricultural Research Service. Accessed on 08-Apr-12. 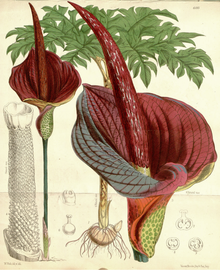 For more multimedia, look at Amorphophallus konjac on Wikimedia Commons. This page was last edited on 1 March 2019, at 16:41.